Keeping with my goal this year, I wanted to sit down today and watch another newer movie. 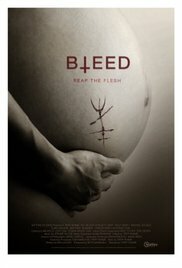 I searched through Netflix for the proper choice and I stumbled across 2016’s supernatural horror movie Bleed. I had read some things here and there about the film but I couldn’t really remember them so I pressed play and relaxed, hoping to find another gem. I can’t say that my goal was accomplished but there are some great aspects to this work. Bleed follows married couple Eric and Sarah who move to a very small, rural community when Sarah is late into her third trimester. The couple invite some friends over to see the house but are interrupted by Sarah’s drugged up, loser brother and his new, surprisingly nice and decent girlfriend. Over the course of the dinner the group decides to go ghost hunting in an abandoned prison where, years earlier, a fire had broken out and killed a serial killer preacher named Kane. Sarah stays behind, not wanting to take part in the hunt, but when her friends and family venture into the prison, the spirits awaken, especially Kane, and he is out for blood. Even writing the premise of the film made my skin crawl a little. The movie is pieced together with elements from many, MANY major films and it utilizes so many tropes and clichés while falling victim to them as well. Sadly this review is going to be much shorter than my normal fare, mainly because there isn’t a lot really to say. The film felt unfinished. There were plot holes and loose ends galore and they ended up permeating the film in a way that made it difficult for me to focus on what was actually happening in the story. The acting, for the most part, seemed incredibly forced. Each character was a cliché stock persona and so there was little to no room for development. Sarah, played by Chelsey Crisp, was serviceable, not really wowing but doing what needed to be done. The supporting cast however felt incredibly wooden and forced, especially the dialogue. The only real bright spot on the cast was Lyndon Smith, who played Skye, the brother’s girlfriend. She was not only beautiful but genuinely convincing as her character. A positive about the movie is that it was shot incredibly well and if I am not mistaken, utilized a RED camera to ensure the beauty in each shot. The only time I was really pulled out was when the serial killer showed up and the whole screen became basically a throwback to Dukes of Hazzard, if that was shot by Rob Zombie. Overall, there were some great moments and scenes that left me wanting more of their ilk. The film itself could have been simply another okay to decent low-budget horror film if not for the editing and writing. There are threads started and slightly expanded which were far more interesting to the story than what we received. In the end it felt as though they started a bunch of great ideas and only finished one, the clichéd mess of young people being hunted. The film falls apart because the structure is laid but no one bothered to nail in a solid plot and so those walls collapsed. It is on Netflix and it is very short so if you want to check it out, go for it. Just don’t expect something awesome—what you end up with instead are just questions and no answers.